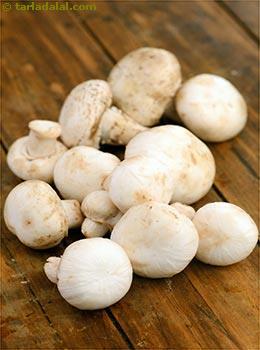 Button mushroom is widely available; varies in color from white to light brown and in size from small to jumbo stuffer. It has pleasing flavor, intensifies when cooked. Mature mushrooms with open veils have an intensely rich taste. It is quite versatile, being excellent for use, both in raw and cooked form. The glycemic index of mushroom is 10 and the glycemic load is 1. Is Mushroom safe for diabetics? The glycemic load of 1 cup of raw mushroom is 1 which proves to be beneficial for diabetics. This depends on the amount of carbohydrates present in one serving of the food item. Mushroom only contains 3.4 grams of carbs in 1 cup. Thus the blood sugar levels will remain stable. It is advisable to equally distribute your carbohydrates throughout the day. 45 to 60 grams of carbs is recommended per meal to avoid further complications. Mushroom are rich in B complex vitamins, thus helps in lowering the homocysteine levels and ultimately cut downs your risk for cardiovascular disease. Being extremely high in potassium and low in sodium, mushroom aids in regulating your blood pressure. It also helps in muscle contraction. Is Mushroom suitable for weight loss? 1 cup of raw mushroom (approx.74 grams) provides only around 19 calories making it perfectly fit to be included in the balanced diet for weight loss plan. Since mushroom is very low in calories, it appears to be very low in carbohydrates too. The fiber content in mushroom will help in increasing the satiety levels. Thus your appetite remains under control. Try to include mushrooms in low calories meals rather than recipes high in calories and fats. This will not contribute to weight loss. It also has negligible amount of fats.